The water caltrop is any of three extant species. The species are floating annual aquatic plants, growing in slow-moving water up to 5 meters deep, native to warm temperate parts of Eurasia and Africa. The plant is also called as water chestnut, buffalo nut, bat nut, devil pod, ling nut and singhara. They bear ornately shaped fruits. Each fruit contains a single very large starchy seed. In India and Pakistan it is known as singhara or paniphal and is widely cultivated in fresh water lakes. The fruits are eaten raw or boiled. When the fruit has been dried, it is ground to a flour called singhare ka atta. Singhare ka atta is used in many religious rituals and can be consumed as a phalahar diet on the Hindu fasting days, the navratas. 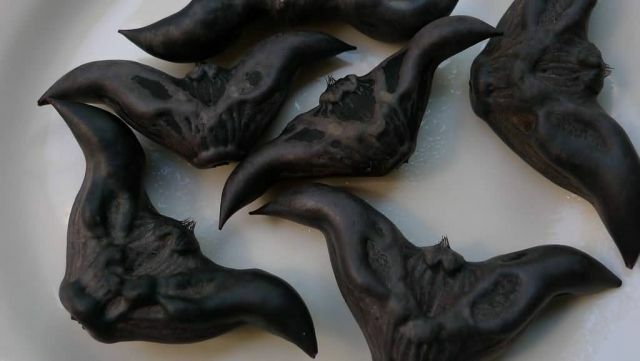 Water caltrop has been an important food for worship as prayer offerings since the Chinese Zhou Dynasty. The Chinese Herbal Medicine Summary indicates that water caltrop can help fever and drunkenness.